In order to use the databases you must be actively registered and have information regarding your ID# or PID# and PIN. If using the system for the first time, please take a moment to review the info below. What is the login procedure? Your default PIN is the four digits of your birth date: MMDD. For example, if you were born on July 04, your PIN is 0704. Your borrower number is the 14-digit number on the front or back of your FAU Owl Card, beginning with 21976. Please visit our LibGuides for more info. BC and FAU patrons may change your PIN at My Account on the UCL web page. Once you have provided your ID# and PIN, you will be logged in. Click on the e-book or database you wish to use. As long as you do not close your internet browser, your login will stay active and you should not have to re-enter the numbers. What if I get an error message while logging in? A.) Close the web browser and try again. B.) Try again with a different web browser. 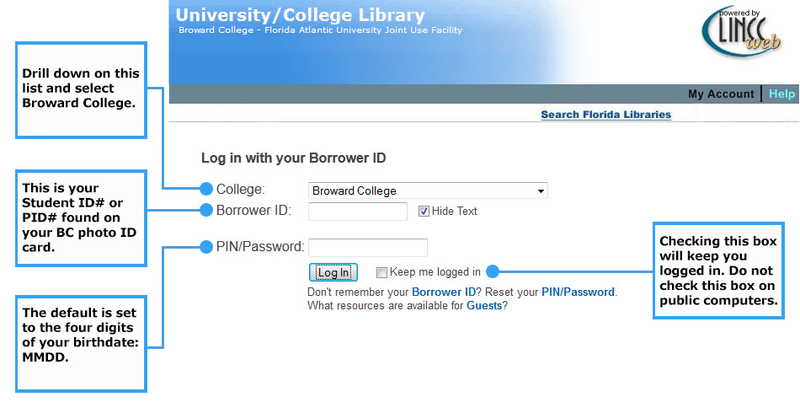 If you have any difficulty or need further assistance with our electronic resources, contact us via email: refucl@broward.edu or via phone: 954.201.6653. Authorized use of our electronic resources is governed by state-wide licensing agreements with database and e-book providers which restrict use to currently enrolled students and currently employed faculty and staff of Broward College and Florida Atlantic University-Davie.